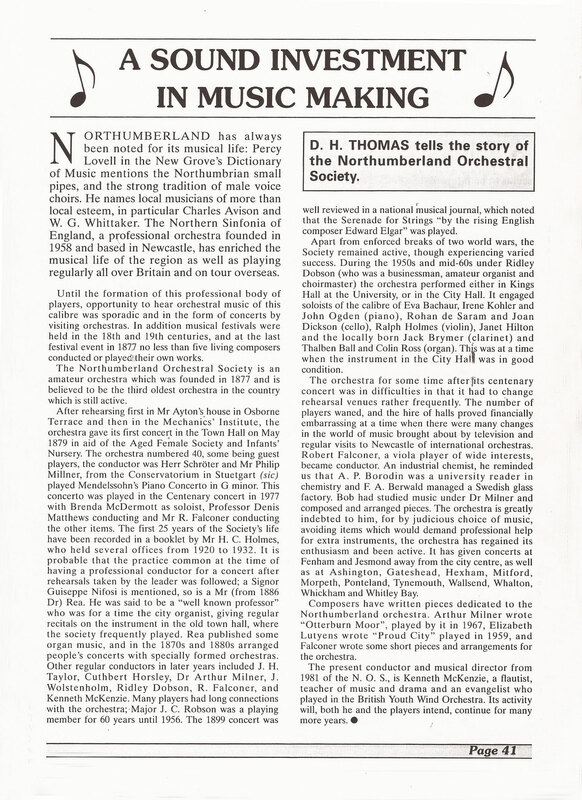 The Northumberland Orchestral Society began with a meeting held on Saturday 15th December 1877 at 3pm “to consider the forming of an Amateur Orchestral Society in Newcastle”. The first rehearsals were held at the house of a Mr J F Ayton at 9 Osborne Terrace, but on March 2nd 1878 they transferred to the Mechanics Institute (now demolished), which was near the Laing Art Gallery. There were then sixteen playing members conducted by a Mr. J H Taylor. They gave no concerts during the first season. The first public concert was in May 1879 in the old Newcastle Town Hall (now also demolished) with Herr Max Schroter conducting. It was given in aid of the Aged Female Society and Infants’ Nursery, and the program included Mendelssohn’s Piano Concerto in G minor played by a Mr Philip Millner. (This same concerto was played at the centenary concert in 1977 by Brenda McDermott with her husband Prof Denis Matthews conducting. The rest of the programme was conducted by Robert Falconer). The regular annual concert was held in the old Town Hall until the outbreak of war in 1914, when the orchestra suspended all activities. When the committee decided to resume rehearsals in 1919, a new rehearsal venue was needed. Eventually the King’s Hall at Armstrong College (now Newcastle University) was made available for the 1919-20 season. The first post-war performance was in 1921 in the Town Hall, and concerts continued to be held there until the concert hall in the building was closed in 1927. From 1927 until the outbreak of the second world war the orchestra continued successfully under the conductorship of Cuthbert Horsley, the concerts being held in the King’s Hall. After the war Dr Arthur Milner revived the orchestra which he conducted until 1947, after which Jack Wolstenholme took over. Dr Milner was a local composer of note and Head of Music at the Newcastle Royal Grammar School, a position to which Mr Wolstenholme also succeeded. One of Dr Milner’s compositions, Otterburn Moor, was dedicated to the orchestra and first performed by them in 1967. Ridley Dobson, a businessman and organist, took over as conductor in 1954 and got the orchestra to perform more ambitious works; concerts were given in the Kings Hall, the City Hall and later the People’s Theatre. Many famous soloists were engaged during this period including a young Julian Lloyd Webber (who required a fee of only £50!). The orchestra was at its largest in 1966 with 72 members. Mr Dobson resigned as conductor in 1973 and was replaced by his assistant, Robert Falconer, an industrial chemist, viola player and composition pupil of Dr Milner. In 1981 Mr Falconer was replaced as conductor by Kenneth McKenzie, a music teacher and flautist; concerts were usually given at Mr McKenzie’s church in Wingrove Road, Newcastle, where he had an official capacity. Rehearsals were held in St George’s Church Hall, Jesmond. Mr McKenzie left the orchestra at the end of 1993 owing to pressure of church duties. He was succeeded by Gillian Coop (our first female conductor). Born in Leeds, she spent most of her school days in Cheshire, attending Altrincham Grammar School where she learned piano and violin and performed in choirs, orchestras and music ensembles. She studied at the Royal Manchester College of Music and then came to Newcastle to teach music at Central Newcastle High School where, as Director of Music, she taught music (including piano and violin) to 12 to 18 year olds and directed choirs, orchestras and chamber music. The choirs, in particular, were very successful in numerous national and international competitions, performing at the International Festival for Youth and Music in Vienna for several years and also touring Germany. Sadly, Gillian had to retire in 2011 due to ill health. In 2011 the orchestra moved to its new rehearsal venue ‘The Castlegate’, in Newcastle city centre, where we were conducted by Chris Griffiths, a french horn player with the Royal Northern Sinfonia. In 2014 we appointed our current conductor, Alastair Lord, and the orchestra are enjoying performing challenging programmes under Alastair’s baton. In 2017, we moved again to our current rehearsal venue at Jesmond United Reformed Church in Newcastle, where we continue to play a varied and challenging repertoire. If you would like to read more about our history, here is an article written by ex-member David Thomas, which was published in “The Northumbrian” magazine.